building (which houses both the d.school and all other design programs at Stanford) isn’t until May 7. Fast Company got a sneak preview, and we’ll be giving you a guided tour (along with photos, videos and critiques of the space from the students themselves) in the days ahead. We’ll go behind the scenes to show how every nook, cranny, and fungible wall system has been smartly designed to maximize collaboration. The new space shows off the results of those insights in everything from custom furniture to studio design to walls that can be reconfigured at will. (We’ll show you the results in upcoming posts.). D.school planners have even built in a special area on the first floor where they can begin prototyping the next iteration of space. school’s original home which was on the very fringes of the campus. 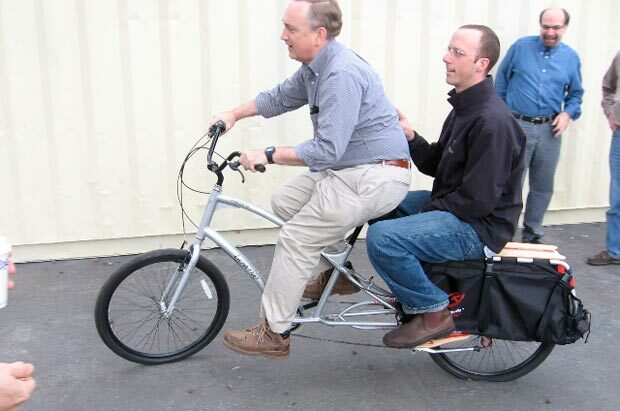 The photo below shows one of the professors, Jim Patell, riding first year fellow Adam French between buildings. Now, there’s so much space, you can motor on through the building, from the video soundstage to the digital prototyping lab, stopping by impromptu classrooms along the route to offer an idea on somebody else’s project. Innovation Road Trip!